1. Do I choose a specialization right away? If so, how? From what I know about well-established translators, many identify a specialized field in which they translate: finance, medicine, business, patents, you name it. Some of those people will say they worked hard to get into that field, while others will say it chose them. Knowing that, I have to wonder: should I be pursuing subject-area competence on my own, or waiting for a specialization to find me? If I am to pursue it myself, how do I know which area to choose? One possibility is to choose a field and find a way to work in it while I am in school to gain subject-area knowledge in the hopes of someday specializing in that domain. But is this the best way to specialize? And if not, then how else can I increase my knowledge in a relevant subject? 2. What kind of training do I need to succeed and be a good translator? This is a question I think many people currently in the field disagree about. When I finished my undergraduate degree and decided to pursue translation, it wasn’t immediately obvious whether it would suffice, for example, to have a Bachelor’s degree in Spanish or to have spent a semester living abroad. I also didn’t know whether a graduate degree was a necessity—was it possible, I wondered, to be respected and successful as a translator without a T&I degree? Was it advisable? Another question I considered was what kind of degree to pursue and how long it would take. ATA’s “list of approved translation and interpreting schools” pointed me toward schools that would offer the kind of degree I wanted and felt I should have… but which would I attend? Online or on campus? A Master’s degree, Ph.D., certificate…? 3. How do I get experience if I have no experience? This one still lingers on my more pessimistic days… I’m in school now and I do my homework, work hard for my grades, but when I graduate I know employers, agencies, and clients will want to see experience on my resume, not necessarily a high GPA. But then, if I don’t already have experience, how do I ever get it? The simplest answer I’ve found so far is to volunteer. There are a host of sites which give both new and experienced translators the chance to do pro bono work and beef up their resumes a bit in the process. Plus, the coursework I spend time on now isn’t just busywork; it will help me demonstrate to potential employers that I have the skills to do a job well. 4. How do I even begin to set rates? Go to any conference or gathering of translators and interpreters and it won’t take long to hear the admonition that even “newbie” professionals should never accept low pay for their work because it undermines the industry. However, with all of the (understandable) silence surrounding rates in the ATA, it is hard for students and newcomers to get a feel for what a reasonable rate is. Many U.S. translators charge per source word. To set a base rate for their translation work, some translators use CalPro, a document created by Asetrad (the Spanish Association of Translators, Copyeditors, and Interpreters) that enumerates the many factors that come into play when setting translation rates. In essence, it provides a framework for determining how much to charge based on your desired annual take-home salary. It even helps you figure out the business expenses that go along with running your own freelance business, like office supplies and computer software. After going through CalPro with my particular case, I wondered whether I could really charge as much as I wanted to as an inexperienced “newbie.” I have my theories about this, but my attitude toward rates is still a work in progress. Attend the ATA conference. At a conference this big, you are bound to meet a huge variety of people from different backgrounds. Attending the ATA conference is an expense, but one well worth it—not only will you be able to sit in on sessions that help you to develop professionally, you will have the chance to meet others who are in the same boat as you are. Check out the ATA website. Don’t take it for granted! 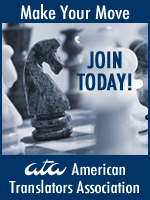 The ATA website has tons of resources for translators, including free webinars. Go to school. There is great value to jumping right in and starting a degree or certificate program. You’ll receive feedback, have professors who are willing to answer your crazy newbie questions, and meet peers with whom you can form strong professional bonds. Join a local chapter. This is a good way to get face time with other translators and interpreters you wouldn’t normally meet in person. Many local chapters have networking events, webinars, and free online resources to help you get started. Look up a school, a translation agency or a translator in your area. When my mind first started to buzz with all these questions, I went to the ATA Directory of Translation and Interpreting Services and looked for a professional translator in my language pair who lived in my area. Lo and behold, I found a Spanish translator living right in my neighborhood who was more than happy to meet with me and give me tips about getting started. I have found that oftentimes agencies are also willing to share with students and newcomers the types of qualifications they look for on contractor resumes and the credentials they expect from their translators, as a means of pointing us in the right direction. What about you? What are your biggest questions about getting started? Feel free to post your questions in the Comments section or email us directly at atasavvynewcomer@atanet.org. A great deal has been written about how to choose a specialization as a translator. An aspect that holds a keener interest in me is how well the aspiring translator writes. If he or she exhibits excellent writing skills, it doesn’t matter which specialization he or she ends up with. Several translators started as engineers, doctors, accountants, biologists, etc. So they started with a home advantage in terms of specialization. But what if you only have your languages or translation degree and no clue as to what specializations to take on? Ask yourself: what do you enjoy reading about? Finance? Medical news? Social issues? Economics? Inventions? Computers? If you enjoy reading about a particular field, say, advances in dentistry, chances are that you may become skillful at translating in that area because your production (writing) will be attuned to that area. However, if you dread reading details about banking operations and mortgage products, chances are that you may not be as skilled at writing about them, let alone translating. This is a great point. I am certainly in that boat and I appreciate your comment. Thanks! Don’t forget ATA in Chicago!